Have you ever heard of the Olympics of Science Fairs called ISEF (International Science & Engineering)? Most readers probably haven’t. But one look at the hundreds of projects these brilliant high school students are presenting is awe-inspiring. These youngsters aren’t just smart, but hopes for the future. 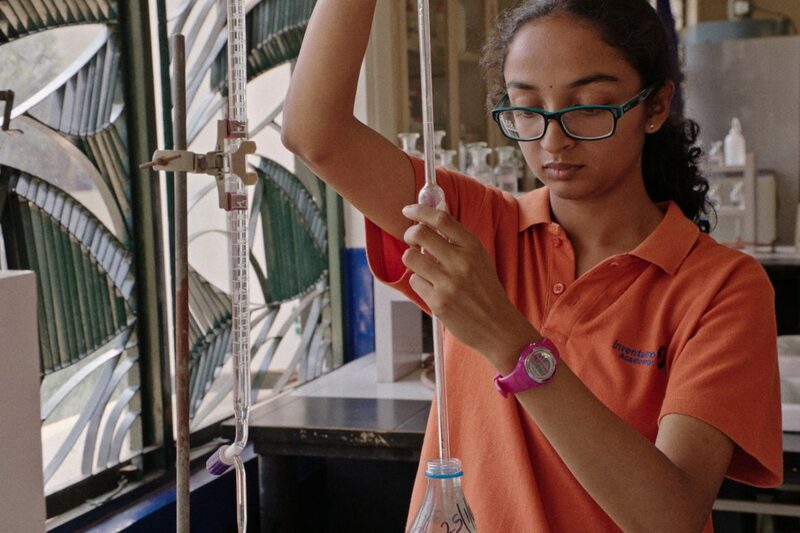 In Laura Nix’s new documentary, focusing on four students’ competing in the annual event, she shares the sad image of environmental crisis they face with joyful and hopeful moments of seeing young people inspired by what change science can bring about. Lesley Coffin: How did you even find out about the International Science & Engineering Fair? I’d never heard of it before? Laura Nix: I hadn’t either and I’ve been continually surprised how little we know about it in the US, because it really is an international event. There’s a reason people call it the Olympics of Science Fairs. These kids, some of the best and brightest of STEM talent come from all over the world. My producers actually came up with the idea of making a film about the fair and when they introduced the topic to me, I knew that I’d need to find a way of telling that story in my own way. So we went to the fair in 2016 and just scouted it. And I was blown away and knew there was a film there. Lesley Coffin: After going to the fair, where did the idea to focus on kids from areas the media otherwise underrepresent in terms of scientific achievement and kids who were concentrating on environmental science? Laura Nix: I met with a number of students at the fair, during that scouting period. And I saw first-hand that when I spoke with young people doing scientific research focused on environmental issues, their connection to the subject seemed to be very personal. And as a storyteller, that was very intriguing. Every single type of science is represented at the fair, robotics to genetic engineering. But when I spoke with people who were literally trying to save their communities, they seemed to have the deepest connection to their subject matters overall. I found that very moving and empowering. And I also have a background in working on environmental issues. And it is a struggle I’ve faced before, figuring out ways to speak about environmental issues in a way which leaves audiences with a sense of agency and a sense of hope. And those students gave me opportunity and a story that went beyond the entertainment of watching whiz kids compete. Lesley Coffin: How did you select kids you ultimately choose to focus on? Laura Nix: We went through a really long casting process. I knew that I wanted to find participates which would give the films a regional, racial, and gender diversity, along with kids whose projects were substantially different. I didn’t want four projects all about climate change or just about water pollution. And in the end we found students who were dealing with environmental issues, but issues caused by different problems like over population, industrial contamination, climate change. And having that variety gives audience the sense that there’s so a lot more kids working on that we didn’t even see. There are a lot of young people working on issues of sustainability and presenting solutions to help the environmental crisis at the fair. So early on we got in touch with science fair teachers from around the world and we asked who in their group of students coming to the fair who were working on solving environmental issues. And we had to explain that we weren’t just looking for students working in the field of environmental science, because solutions can come from the chemistry field or bio-engineering. And after they gave us names of students we would have a local field producer meet with them or we’d interview them over Skype, sometimes with a translator. And we interviewed over a hundred young people. And we were looking for students with a compelling personal story and could articulate what this issue meant to them. And we wanted to work with students whose projects had a fighting chance, so we worked with a science adviser to vet the projects for us. Lesley Coffin: Regarding the desire to have diverse participants, you have students from different parts of the world, but you also have students with very different dispositions. The three boys from Mexico are far more extroverted than Jared from Hawaii whose far more introvert it seems. Were you also looking for opportunities to show different personalities on screen of the types of kids who participate? Laura Nix: We were certainly looking to have a diversity personalities on screen, but that was also just a natural result of finding the kids at the fair. There are kids incredibly socially advanced and kids who can barely look you in the eye, and everything in between. There are a lot of perceptions in popular culture about what scientists are like and it’s important to represent science as a human endeavor. What you find when you spend time in the science and STEM world is every different type of person. Lesley Coffin: Because you were focusing on the competitors going to that year’s competition, I assume you were traveling a lot to capture them within that year. What was your production schedule like on this film? Laura Nix: We originally planned to film them competing in the smaller qualifying fairs that build to ISEF. We filmed some of those regional competitions, but we didn’t use them because they made the film feel too focused on the competition. And that’s the part of the fair that’s the least interesting to me. I didn’t choose students based on who I thought would win. I choose them because I believed in them and believed in their research. They were asking the right questions and coming up with solutions. I didn’t want to consider whether or not they won, that shouldn’t be put first and foremost. I don’t come from a science background so I had to ask a lot of questions, but what I don’t know the audience also probably won’t know. So when I’d travel to film them, I’d just have them take me around and ask a lot of questions about the issues they were dealing with and ask them to explain their research to me. And we’d film their process, in the classroom, working with their supervisors, in the lab. Lesley Coffin: There’s the great moment in the film when the two young women you were following met and noticed that their projects had some similarities. Was that a planned introductions or was that something that happened organically at the fair? Laura Nix: I’m so glad you mentioned that. Every time I’ve screened the film someone thinks that’s something I definitely orchestrated. When I found out that they were talking to each other I was horrified because I knew it would seem staged. It wasn’t staged. I think Shofi noticed Sahithi’s project and started talking to her, and our cameras noticed and chased them down. But it was really exciting to see them sharing research with each other because they’re dealing with very different issues in completely different parts of the world. But they’re starting from the same place of seeing a part of their community being destroyed and trying to figure out ways to put it back to the way it should be. Lesley Coffin: Is that cooperative spirit common at the fair? Laura Nix: One of the reasons I wanted to make this film was the approach these young people have to these issues. And they’re very different from the way my generation sees things. I didn’t have a firm understanding of the environmental crisis we were in growing up. I didn’t really understand the problems until I became an adult. Saying that, I know I could have and had friends in college more oriented to these issues than I was. But when you’re a teenage today, especially if you’re a STEM student, you are going to realize how bad it is, ask questions, and be inspired to change things. And as I would probe and say “it’s kind of hard to do get that done” they’d respond “we don’t have a choice, we’ve been left with this responsibility.” They share a common vision of the future and what their role will be. Lesley Coffin: At the end of the film you filmed a follow up with each of the students. And one of the boys from the team in Mexico, José, couldn’t afford to go to university, he didn’t have the money to even keep his place at the school until he could. In this film about a call to action, why did you feel it was important to include that scene? Laura Nix: I think it’s important to remember that it is a reality that these kids aren’t on an equal playing field when it comes to having access to high quality education. That’s true all over the planet, it’s also true within the United States. And I thought I needed to include that because it was a reminder of the work we have to do in order to level that playing field so young people like José are not left out or left behind. He was in a very precarious situation, and he still is, every year he faces the same economic challenge to go back to school. It’s incumbent on us to create pathways for young people to empower themselves and insure their own survival as we move forward. We’re at a critical point in the history of the planet and this next generation will face very serious changes in their life time. And Stem will be vital in giving them the tools to address these issues. Lesley Coffin: Before we wrap up I wanted to ask you about some of the funding the film received. The film was partially financed Helene Gurley Brown Glassbreaker Films? What is that organization? Laura Nix: Glassbreak Films provides support for women in documentary film. Our team is an entirely female lead team, so it was perfect fit for them. We had a female director, female producers, female editor, a female DP. Even our composer’s a woman. So our executive producer Julie Goldman knew some people a Glassbreaker and they decided to come on board.